Arkın University of Creative Arts and Design (ARUCAD) Founder and Head of the Board of Trustees Erbil Arkın in a bid to crown the establishment of the university is putting on an exhibition of Auguste Rodin sculptures that are in his private collection. 20 works of the French artist who had become immortal with his masterpieces such as “The Thinker””, “Eve”, “The Kiss”, as well as 14 works by his lover Camille Claudel and his friends will be on display at this exhibition. This exhibition of private collection of 34 pieces which is being displayed by ARUCAD aims at popularizing the art of sculpture through the works of a world master and represents the degree of importance that is given to arts and art education. An exhibition of such scope and level is a first in Cyprus. Auguste Rodin (1840-1917) sculpture exhibition that comprises 34 pieces from ARUCAD Founder Erbil Arkın’s private collection is opening to mark the 100th anniversary of the passing of the sculpture artist. 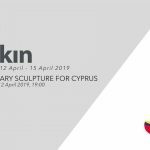 The exhibition which is called “Rodin, His Lover & and His Friends” is open until November 17 at the ARUCAD campus in Kyrenia and can be visited between 09.00 and21.00. A bilingual catalogue providing information about the works on display will be available at the exhibition.